Scientists at UNSW Sydney have made a breakthrough discovery about cholesterol transportation in cells that opens the way for new drugs to increase the body's 'good cholesterol' levels. Until now, drugs including statins – the most prescribed and profitable class of drugs in history – have targeted 'bad cholesterol', also known as LDL (low density lipoprotein), by inhibiting synthesis of it in the liver in an effort to mitigate risk of heart disease and stroke. 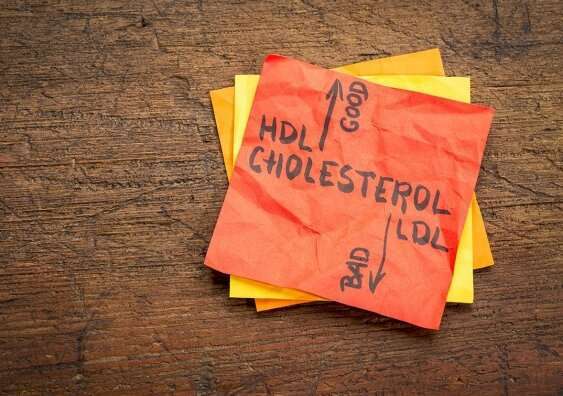 But while statins are effective at lowering LDL levels, they do little to increase the levels of good cholesterol, or HDL (high density lipoprotein), and there is no other drug in use that can significantly boost the human body's HDL levels. The molecule in question, a lipid transfer protein called ORP2, takes cholesterol from an animal cell's organelles – or internal compartments – and delivers it to the cell's surface membrane (also known as the plasma membrane), where cholesterol is used as a structural material to provide strength and flexibility. Up to 90% of a cell's cholesterol is found at the cell's plasma membrane. "HDL, the good cholesterol, is produced by the plasma membrane of the cell," Professor Yang says. "When there is an abundance of cholesterol produced in the cell, some of it leaves the cell via the plasma membrane to form HDL which is then transported around the body. "ORP2 can increase the amount of cholesterol that leaves the cell, a process called cholesterol efflux. We think this pathway will be very important for the development of a drug to increase this good cholesterol." "For a long time, cell biologists have been looking for the answer to a very simple question: how does cholesterol reach the plasma membrane? We know that 90% of cholesterol is found in the plasma membrane. We know that it is made in the endoplasmic reticulum or released from the lysosomes. But we haven't known how it gets from the internal organelles to the plasma membrane where it is needed the most," says Professor Yang. "When we started this project, we were not sure we would find anything. So we were very excited, to say the least, to solve this mystery." Another intriguing prospect raised by the research is that ORP2 could be targeted to fight cancer. The rampant and uncontrolled growth of cells that characterises cancer could be stopped in its tracks by reducing the amount of cholesterol produced, since this is vital for the structure of the cancer cell's membrane. "In many types of cancer cells, ORP2 is hyperregulated, given that so much more cholesterol would be needed to reach the plasma membrane for the rapid expansion of cancer cells," Professor Yang says. "But in cancer cells, you could shut this down. Perhaps if you block the function of this protein, you could stop the cells from growing and multiplying so fast." He says the idea that targeting cells' cholesterol production isn't new in the fight against cancer, but ORP2 could offer a new strategic line of research and possibly succeed where the use of statins in this area hasn't.